I scooted in just under the wire this month! The most difficult thing about the Daring Baker challenges is deciding when to bake them. I like to have someone eat my hard work, but sometimes social events don’t coincide with when I have time to bake them. I wanted to do this cake for my dad’s birthday, but Thanksgiving and his birthday pretty much coincided. So instead, I did cupcakes thinking people could munch on them throughout the day. After reading Shuna’s notes, I would like to make this again as a cake to see how it would turn out. The cupcakes were fabulous! Thank you to Dolores, Alex, and Jenny for hosting! I was really horrible about taking pictures this month, so apologies for lack of evidence! I read through Shuna’s notes on the cake to ensure everything would turn out. I beat the batter until it was light and fluffy and really tried to incorporate the ingredients before moving on to the next one. The caramel sauce, oh the caramel sauce! While it was cooking it was thin and I had no faith in it. But once it cooled, it was beautiful! I cooked it just a little bit longer than I thought I needed to to get a stronger caramel flavor. The buttercream frosting was easy and delicious, although I did have to add a little more cream at the end because it was too stiff to frost. Overall, fabulous! Although very sugary. I added salt, but maybe I needed more? I’m not sure how I stumbled upon this recipe. I think I got lost in the new layout of the Food Network’s website. I thought I was getting some of Ellie Krieger’s multigrain recipes, but somehow I ended up with one of Bobby Flay’s. No matter! This was supposed to be a farro salad, but farro is expensive! No thank you. Also expensive right now? Japanese eggplants. 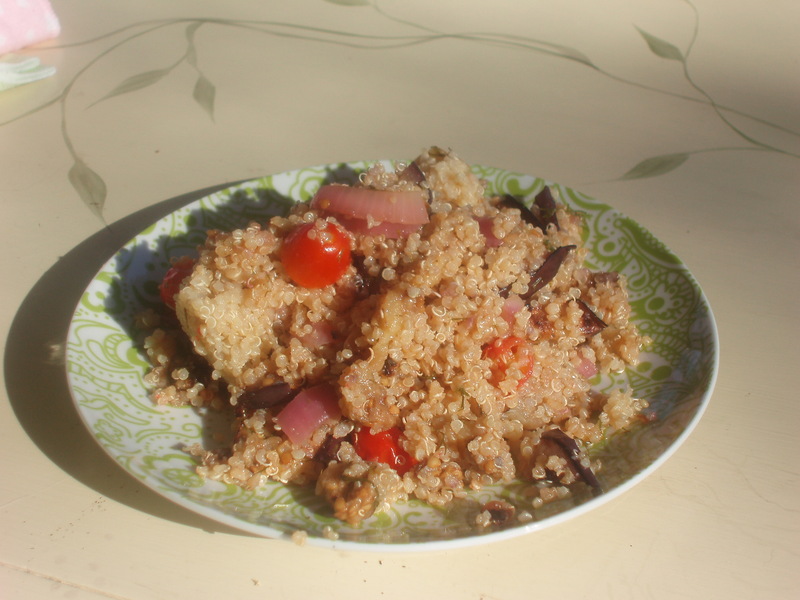 So instead I went with the quinoa in my pantry, and some lovely Whole Foods regular eggplants. I made this recipe as part of an effort to cook more for myself. Unfortunately I decided to make it on a Saturday where the evening was full of baby meltdowns and I was left wondering why I didn’t choose a recipe that at least somewhat resembled comfort food. But, I pressed on and thank god I did! This salad is GOOD. It was good warm, it was good cold the next day with shredded chicken and it was good cold the day after that with diced avocado. It is so good in fact, that I am making another batch just as soon as I get my hands on more quinoa. Combine quinoa and water in large covered pot. Once boiling, lower to a simmer and cook for 15 minutes or until all water is absorbed. Place in a large bowl. Heat grill to high (alternatively, use a grill pan over high heat). While the quinoa is cooking, brush the eggplant and onion slices with oil and season with salt and pepper. Grill for 3 to 4 minutes each side or until just cooked through. Remove from the grill and cut into one inch dice. Add the eggplant, onions, tomatoes, and dill to the quinoa. Pour balsamic vinaigrette over the mixture and stir to combine. 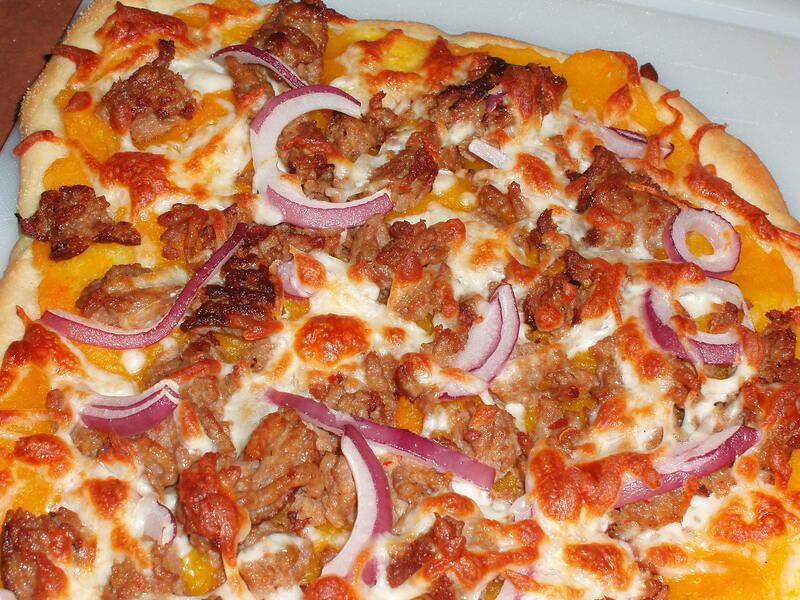 This month the Daring Bakers are tackling pizza. I love to make homemade pizza and have several dough recipes that I use, but none of them employ the overnight technique that I’ve heard so much about. The thing I loved about this recipe was that there was no rising time. Getting dough to rise can be tricky in my house. It’s drafty, it’s chilly and I usually resort to warming the oven a bit and doing it there. But for this I didn’t have to employ any workarounds. And the dough was fabulous! So easy! We had two guidelines for the month. First, we had to toss the dough. Second, the pizza needed a sauce and toppings. That was it! Beyond that we were free to do what we wanted as far as type of dough and toppings. I made the dough with regular bread flour and did both a savory version and a sweet. 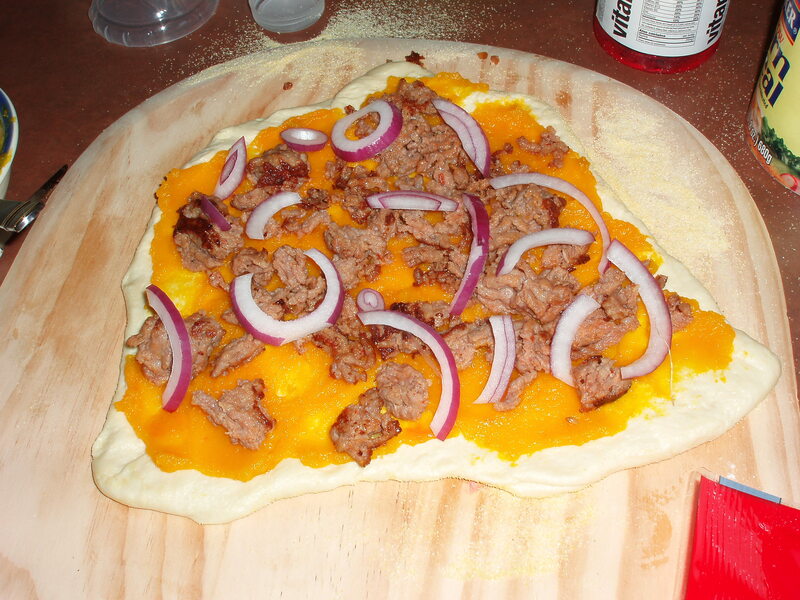 The recipe was the Basic Pizza Dough recipe from Peter Reinhart’s ‘The Bread Baker’s Apprentice’. Thank you to Rosa for hosting! 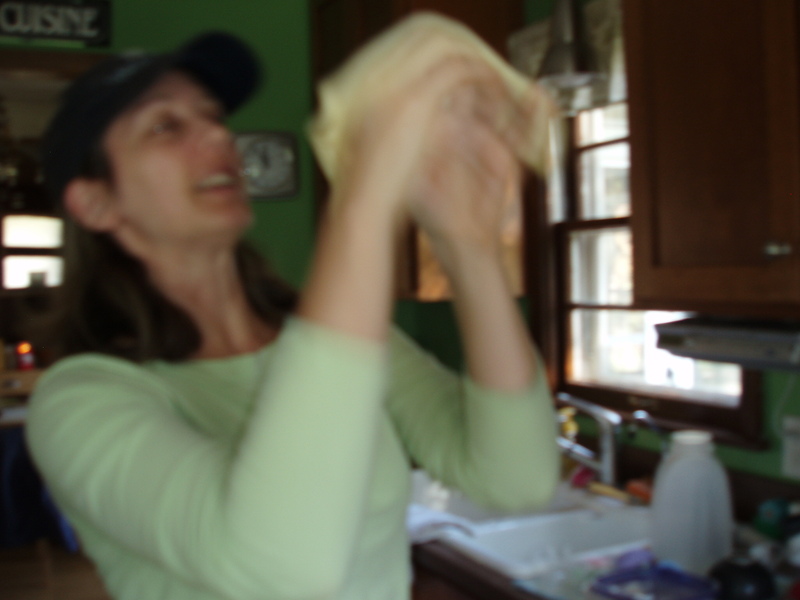 Tossing the dough. I did okay, although the dough was thin in the middle and thicker at the edges. This happened both times and I’m not super sure how to correct this. I like the tossing method to stretch out the dough, but definitely need some help perfecting my technique. Pizza #1. Pureed squash with italian sausage and red onions. I topped it with mozzarella cheese, which was too bland of a cheese. Because the squash was sweet, it needed a cheese with some bite. Next time, feta. Pizza #2. I really wanted to make a dessert pizza. I thought about doing a PB&J pizza, but I had cream cheese in my fridge that I wanted to use up. In the end I did cream cheese as the sauce and topped it with kind of a streusel topping – brown sugar, flour, butter, oatmeal, chocolate chips and almonds. I wanted some chocolate and some caramel, but I went a little heavy on the streusel. Next time no flour, and less of everything else. This month’s challenge went down a slightly different path. There was no butter or cream. No chocolate or fruit. 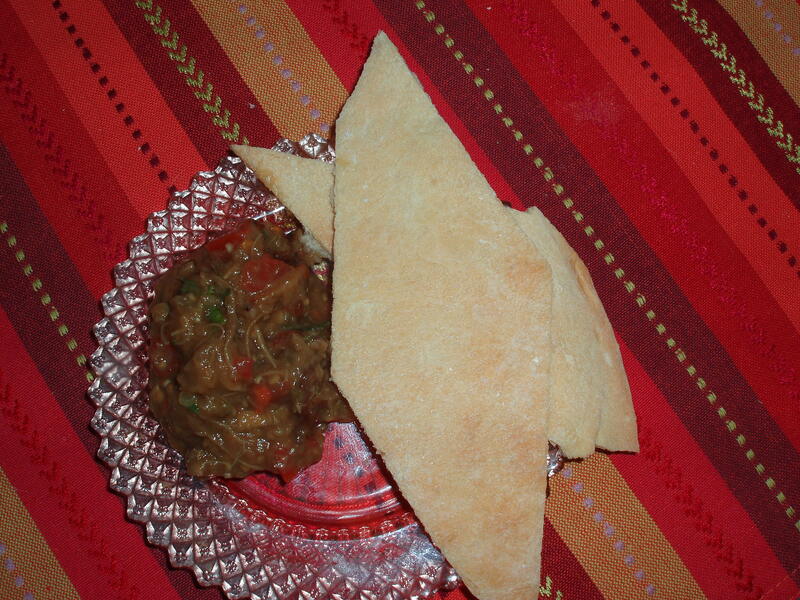 Instead, we were tasked with Lavash crackers plus a dip that was gluten free and vegan. I was excited for so many reasons. First, I’ve always wanted to make a cracker. Second, with two little ones that are eating now, soon crackers would be the perfect finger food. And third, with the bounty coming out of the gardens, I would have tons of inspiration for a dip or relish. I will absolutely make this recipe again. I’m sad I made it late in the game and didn’t have time to play around with toppings. I know several Daring Baker’s did a sweet version of this with cinnamon and sugar. Yum. I will definitely play around with this in the coming months. Thank you to Natalie and Shel for hosting. You can visit their sites for the full recipe. First time I made the cracker, it totally bombed. My bread flour was old and I think it had no gluten left. No matter how much I kneaded it just never got to that windowpane consistency. I thought maybe rising would help it. No. Maybe rolling and baking? No. It came out of the oven with a flat, dull taste and was awful. I made it again last night and was so nervous. I kneaded and kneaded, but worried I hadn’t kneaded enough. The dough rose beautifully though, and rolled out perfectly. Or had it? Suddenly in the oven the dough was looking too thick! I worried that again I had somehow messed this up. But when I snapped pieces off and tasted it, it was so good! I think I could still roll it thinner, but I’ll happily eat what I have! I have tomatoes coming out of my ears, but that wasn’t the direction I wanted to go with my dip. Instead I was drawn to the eggplants I saw at the Farmer’s Market. I went with this recipe, with some slight variations. I really loved it. It tasted fresh, perfect for the end of summer and help up well over several days in the fridge. Cut the eggplant in half lengthwise. Bake, cut side down at 400 degrees for 60 minutes. Once the eggplant is cooled, use a spoon to scoop pulp from the skin; discard skin. Mash the pulp in a bowl with a fork. Add the other ingredients and blend well. Season to taste with salt and pepper. Cover and chill for at least 2 hours before serving. Eclairs! Is there anyone who doesn’t love a good eclair? Given the choice in a bakery I will more often than not choose eclairs over other pastries. They bring a little of everything to the party. Love them as I do, I was very excited to learn our August challenge was to make eclairs. I’ve done cream puffs before with varying end results. Sometimes they puff, sometimes not so much. Since I love both cream puffs and eclairs, I was really hoping to master pate a choux once and for all. For the full recipe, please visit Meeta or Tony. Thanks for hosting! The recipe provided gave both a chocolate pastry cream and a chocolate glaze. One of the two elements needed to remain chocolate, but we were free to experiment with the other. This was difficult. I love the standard eclair with vanilla pastry cream and chocolate, but the chocolate pastry cream also sounded really good. But I wanted to push my boundaries a bit so I decided to do three pastry creams. I made a vanilla and then flavored one third with coffee, one third with hazelnut praline paste (leftover from last month) and left one third vanilla. In the end, the hazelnut praline was definitely the winner. Also, I will definitely use this pastry cream recipe again. It had only 3T of corn starch in it instead of the 4T my normal recipe has and I liked the consistency much better. Winner! I should probably state here that my eclairs didn’t rise. Why? We’ll examine that. On to the dough. I think my dough came together rather well, but other Daring Bakers noted that the consistency of the dough made a difference in how well they rose. I piped them out using a disposable pastry bag. Was my piping an issue? I think it may have been. I felt like I piped them “flat” instead of giving them a little fluff. As you can see, not many rose. I read many a comment on this issue. In the past I’ve thought that opening the oven door was an issue on how well my cream puffs rose, but this recipe specifically called for opening the oven door partyway through the baking so that can’t be it. Some people put a dish of water in the bottom of the oven, which is a trick I would like to try. Others let them cool in the oven which is also something I would try next time. I had committed to bringing these to a picnic so I had to find a way to rescue them. I thought if I used a sharp knife I could cut them in half still, but many had pockets of air on the bottom so it wasn’t doable. Instead I declared half of them bottoms and half tops and went with it. It worked as well as it could. Some were piped with only one pastry cream, others were duos. The end result was quite lovely! The chocolate glaze held up well and the eclairs tasted very good. Oh, the Daring Bakers. When I first joined the group (a year ago!) the recipes were challenging but fun. When I came back to the group after having the girls, baking the recipes made me feel like a real person again. This month, it just felt like a lot of work. I made this month’s cake for the girls baptism, which was both a good and a bad idea. Good, because I was in the baking, organizational mode. Bad, because it just piled stress onto an already stressful weekend. I did have some help baking this cake. My friends Amy and Amanda helped and truly, without them, it wouldn’t have gotten made. I had high hopes for the recipe. The picture was gorgeous, I do love me some hazelnuts, and I had never tried my hand at swiss buttercream. But the recipe was complicated and difficult to understand, there were a lot of moving parts, it took forever, and in the end, it just didn’t come together that well. There will not be a repeat of this cake. Please go see the lovely Chris at Mele Cotte for the full recipe. As always, I made this cake in parts over several days. First up was the cake. I baked the cake in a 10″ springform pan which worked very well. Despite much tapping, the cake sank a little in the center. It looked good though! And now we get to the part where I took no pictures. While the cake was being made I made the praline paste and the sugar syrup. Small note about the praline paste, totally misread the part about processing longer to get it to an actual paste. Mine stayed at crumbs. Oops. The next day I made the swiss buttercream. I was nervous, but wow! It came together with no issues and I have to say, I loved it. Just the right sweetness and a great consistency. Cake assembly! Amy was scared to cut the cake into three sections so I went at it. Brave does not mean skilled. The sections were not created equal, and while I hoped we could fix the issues with buttercream, that didn’t especially work. The ganache was fun to put on the cake, although terribly messy. I did hate to waste all of that chocolate. There were no real issues until I pulled the buttercream out of the fridge to pipe with. It was a tad hard. It never really softened properly, it was really more that the butter melted. When I would squeeze the pastry bag butter would squish out first, then the frosting. It worked okay though. A finished piece of cake. =( As you can see, my layers didn’t work so well. Over the Fourth of July weekend, the girls and I hung out at my parents house. Saturday was gorgeous but very windy. While everyone else played in the water, the girls and I stayed in the house. I was feeding one, with the other sleeping on a boppy next to me, Food Network on the tv. Bobby Flay’s Throwdown was on, the coconut cake challenge. I’ve never been a huge fan of coconut cake, but these cakes looked divine! I was already annoyed we couldn’t be down by the lake with everyone else, and now they were taunting me with a gorgeous coconut cake?! I would have given anything to have a piece of that cake. So, I did what any good baker would do and I found the recipe online. Luckily, it didn’t look that complex. Plus, coconut custard! Anything with coconut custard has to be delicious. And it was. This cake was crazy delicious. The cake was light and fluffy. The filling was sweet and creamy. The buttercream was perfection and the toasted coconut was the perfect crunch. The whole thing just worked perfectly together. Everyone loved it, even the younger kids. I didn’t use to love coconut, but I am a true believer now! While there are a few components to the cake, none are difficult. Bobby gets a little precise with his cake directions, but it was worth the effort. Also, even though I didn’t cut the cakes in half super evenly, I was able to make them even with the coconut filling. I always think I have little baking experience, but I think that mainly comes from the fact that most yeast things that I try to bake don’t really turn out. But the truth is, I used to assist cooking classes and one summer I assisted a ton of baking classes. You don’t realize how much information you’ve absorbed until you have to turn around and use it! Luckily I had seen laminated dough made in one of those classes, so it wasn’t intimidating to me. Again, my main challenge would be time, although thank goodness for maternity leave! The recipe was for yeasted laminated dough. We were required to make one danish braid and then could do whatever we wanted with the rest of the dough. I chose to make two danish braids, mainly because I didn’t want to freeze the dough. I ate one and gave the other to my friend who helped me put the braid together. Her family loved it! I don’t always have time to read all of the questions regarding the challenge, but I did notice that a few people had issues with the dough. I had zero. I chilled my flour, it wasn’t very humid, and everything rolled out perfectly. I was able to make the dough and do my turns in between naps and bottles. For my filling, I decided to do pastry cream and mixed berries. I love pastry cream. Love it! Plus, I’ve made it before and knew I could make it quickly (major consideration). For the mixed berries, I used fresh blueberries, blackberries and raspberries. I followed the apple filling recipe for the most part. The berries were a little soupier than I would have liked, but they turned out very nicely. Our one mistake was not filling and braiding the first one *on* the sheet pan we were baking it on. We eventually got it onto the parchment paper, but it took a lot of maneuvering since the braid was fairly heavy at that point. Second time around we made the braid on the parchment paper. For the full recipe, visit Kelly at Sass & Veracity. The rolled out dough, cut into strips. With the filling down the middle. After tasting the finished product, we definitely could have put more pastry cream in. Extra braids? Just cut them off and use them to seal the ends! Genius. 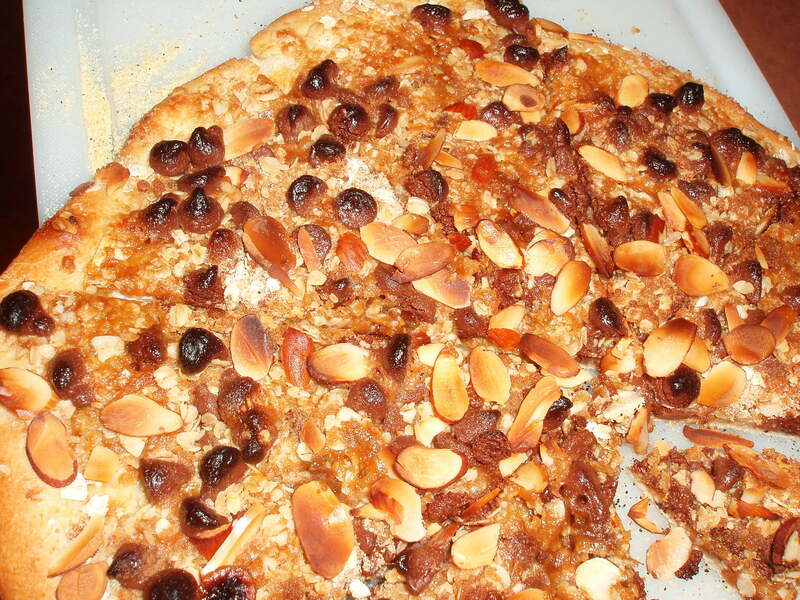 Egg wash, sugar, and sprinkled almonds. It’s Daring Baker time again! Each month, everyone makes the same recipe and we post about it on the same day. This month, we made an Opera Cake. The hosts provided the recipe, but each person was able to customize theirs by choosing how they wanted to flavor it. The only restriction was that the flavors were to remain light and springlike, nothing dark – no chocolate, coffee, or cocoa. I made the cake for Mother’s Day and since I just had twin girls in March and my life is inundated with pink, I choose raspberry as my flavoring component. For the recipe, visit Ivonne at Cream Puffs in Venice. An Opera Cake is made up of five components. Joconde – I used two 10×15 jelly roll pans to bake my cake and they worked perfectly. I couldn’t find almond meal and so made my own which worked fine. Syrup – I added 1/4 cup of seedless raspberry preserves to the syrup. The raspberry flavor was perfect, not too overpowering or sweet. Buttercream – I researched a few different raspberry buttercream recipes to decide how to flavor this component. In the end, I threw in 1/4 cup of fresh raspberries in the final minute of creaming. Perfection! Mousse – I would have liked to flavor this with an amaretto liquer, but didn’t have any hand so Chambord it was. Ganache – This was white chocolate and required not extra flavoring. With newborn twins at home I needed to be strategic about baking this cake. There was nothing incredibly difficult about any of the components, but there was a lot of moving parts. I did the syrup on Wednesday, the mousse on Thursday, the buttercream on Friday and the joconde and assembly on Saturday. This worked wonderfully except I didn’t allow enough time for the cake to set on Saturday before we ate it. The cake was good, but the mousse wasn’t how it should have been and the cake tasted *much* better on Sunday. We loved this cake so much I’m planning on baking a slightly different version for the girl’s baptism in July. The white chocolate was a little too sweet for me. I’m excited to see how it will taste with a bittersweet chocolate ganache and mousse. The first layer of cake and raspberry buttercream. Second layer of cake, raspberry buttercream, and then the third layer of cake. And finally the ganache! Unfortunately, we were crunched for time so I didn’t do any fancy decorations on top of the cake. I had planned to do fresh raspberries around the edge, but we just didn’t have time. For the baptism, I’m hoping to pipe the girl’s initials on each piece of cake. It’s Daring Baker time again! December was a bit of a rough month for me with way too many doctor appointments and holiday commitments, but I was determined to bake again in January! I love the Daring Baker challenges, as well as the camraderie that goes along with this group. Go here to visit the other Daring Bakers. This month our challenge was Lemon Meringue Pie. I’ve made some pie crusts before, but I really haven’t made many pies. My mom and my aunt are the pie makers in my family. I’m more the one that brings creme brulee to every gathering. But, I love Lemon Meringue and so was very much looking forward to this challenge. For the full recipe, visit Jen at the Canadian Baker. First, the crust. I’m a hand person when it comes to making crust. I know a lot of people do them in food processors, but I want to be able to look and feel the butter and how small it’s getting. I’ve done mine with my hands before, this time I used a pastry cutter. Being winter in Minnesota, my house is very dry. The recipe called for 1/3 cup of water. I added about 1/2 cup, but I was a little nervous about adding it since I didn’t want to overmix the pastry. Even with the extra water, my dough was a little dry. It rolled out fairly well. I could see nice chunks of butter, but parts stuck to the counter and it didn’t necessarily make it to the pie pan all in one piece. A little patchwork and we were good though. Someday, I will invest in pie weights. Until then, it’s whatever looks old in the cupboard. The lemon curd was super easy to make! I’m not sure why I thought that would be labor intensive. Boil water, add cornstarch and sugar, temper in eggs, add lemon juice. The meringue whipped up perfectly. I admit, after reading others posts about weepy meringue and the meringue needing to go on top of hot filling, I smudged the directions a bit. I didn’t let the filling cool completely, just the amount of time it took me to make the meringue. And still, it wept. I had incredibly tasty lemon meringue soup. I’m sad it looks so horrible because it tasted delicious! Possibly some of the best lemon meringue pie I’ve ever had. It even kept for four days before I threw it out! I will definitely make this again, but I’ll most likely make the meringue first and make sure it goes over a HOT filling.